The 8 Best Pumpkin Picking Spots in Arkansas! Pumpkin spice, pumpkin pies, pumpkin carving…you name it! Pumpkin season is upon us and that means heading to your local farms to pick up a perfectly plump pumpkin. From Little Rock to Springdale, here are our favorite pumpkin patches in Arkansas. This place is known as the home of the place to pick! You can pick your own pumpkin or choose from a variety of pre-picked pumpkins. Pumpkin prices range from $1 to $75. You’ll find something for everyone at BoBrooks Farm in Roland. This Arkansas grown, Arkansas made farm was established in 1994. Admission to this amazing pumpkin patch is $7 for ages two and up. 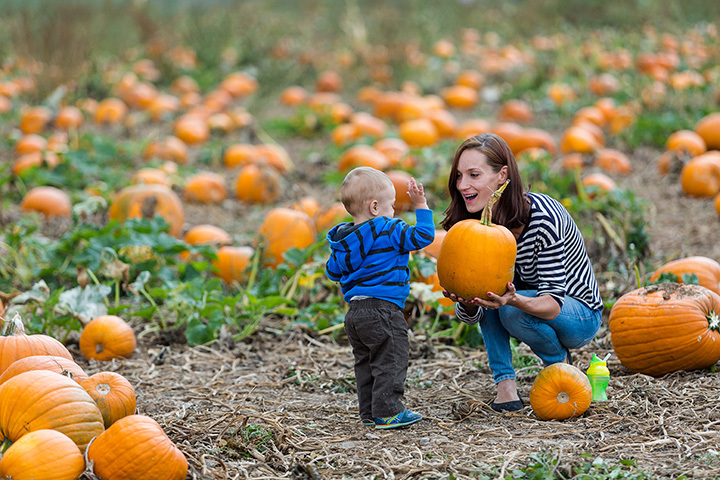 In addition to a large selection of pumpkins, you’ll find activities for the whole family to enjoy. Peebles Farm is well-known for its 16-acre hand-carved corn maze, but it offers a great pumpkin patch as well. A 60-acre pumpkin farm, in fact! You can choose from a large selection of pre-picked pumpkins or use the farm’s complementary wagons and pick your own. Welcome to one of Little Rock’s favorite spots for fall family outings! Motley’s offers a beautiful pumpkin patch with thousands to choose from. At Motley’s Pumpkin Patch, you can pick your own pumpkin right off the vine. This great spot was established in 2014 and has quickly become a Central Arkansas favorite. Roseberry Farms is open to everyone looking for a great place for some outdoor family fun. Take your pick of some of the best pumpkins in this area of the state. Hick’s Family Farm is located between Cabot and Lonoke, Arkansas, 35 miles northeast of Little Rock. When you’ve had your fill of this great pumpkin patch, check out the pony rides and the hay rides. Farmland Adventures is one of the best places in Northwest Arkansas for outdoor family fun. In addition to its fabulous nine-acre corn maze, you’ll find a noteworthy pumpkin patch. Be advised that pumpkins purchases are not included in the price of admission. This place is the perfect pick for fun! Schaefers has been serving the Mayflower area for nearly two decades. Schaefers invites groups of all kinds to come out for some fun on the farm.